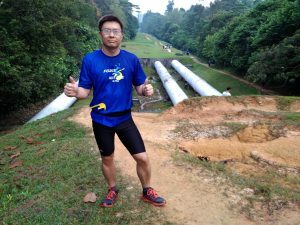 Review: Force of Nature Ultra 2018 [12 km] (by Stargazer) | JustRunLah! I had always wanted to do a trail race, especially one that was organised by The North Face (TNF). 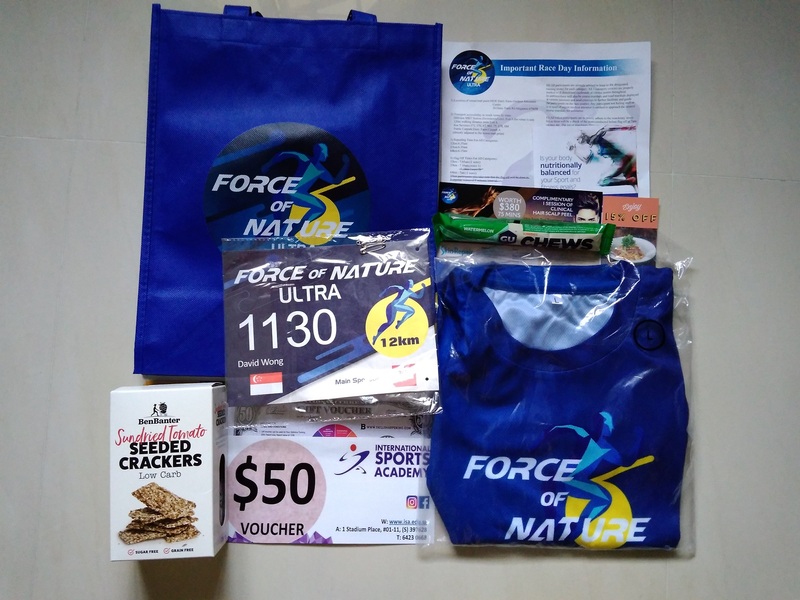 So when I knew TNF was organising the Force of Nature Ultra race, I made up my mind to sign up without hesitation! I am a road runner, so to take the plunge into trail do take some commitment and discipline. This is also why signing up for a race (well, any race) has its benefits, in that it gives you a reason to train and ultimately stay healthy along the process! My preparation consists of: ensure having the appropriate gears and of course, training. Race participants were entitled to purchase TNF products at discounts. I took this privilege to purchase my first trail running shoes, a North Face Ultra Vertical at a 50% discount off the retail price! Having the right shoes are probably the most important factor for running in the uneven terrains. Safety is the first consideration. In addition, I also bought a water bottle carrier so that I can drink to stay hydrated in the trails. I know that drinking (or toilet facilities) are rare in the forests! When it comes to training, I must admit it did take some effort to travel to Macritchie and Bukit Timah to be familiar with the trails. In fact, I actually tested out the race route so that I would be familiar with the route and not depending too much on the directional signs during the actual race. Nevermind there were a couple of wrong turns – just enjoy the process! Also, I have been doing circuit trainings and so in a way, I believe these workouts do provide me some stamina to ‘survive’ the trails. There were 3 categories: 12 km, 23 km and 64 km. What I like about this race is that the route consists of 2 popular trail areas: Dairy Farm (Start Point) and Macritchie (End Point). As this was my first trail race, I participated in the 12 km category which according to TNF, was suitable for those starting out in trails. I targeted to complete the race within 2 hrs, though the cut-off time was a generous 4 hrs. Race pack collection was during one weekend before the race, at a make-shift booth outside TNF outlet at Marina Square. The queue was short and collection was relatively smooth. On race day 7th July, I woke up early to take the first train at 5.50 am from Bedok North to Hillview. 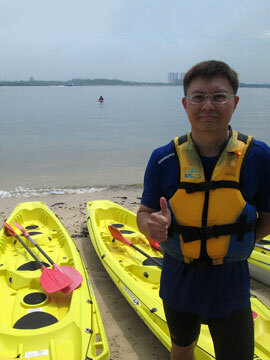 I reached MOE Adventure Centre at 6.45 am. Many runners had already arrived and waiting along the pathway leading to the start pen. 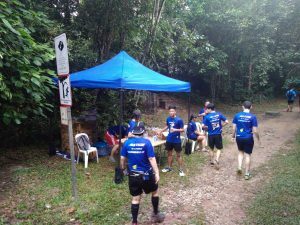 Those who wished to deposit their bags dropped them off directly into a truck, where they would be transported to the Finish Point at Macritchie. The 12 km runners were first flagged off at approx 7.05 am, followed by the 23 km and lastly 64 km runners within 10 mins interval. I ran with the 23 km wave as I had missed the 10 km flag off in part due to the soft announcement by the organizer. But this was not a concern as I was taking this as a leisure run. The start of trail brought the 12 km runners to the Belukar Track, whereas the 23 km runners turned left towards Zhenhua Nature Park. We continued along the MTB trail, sharing the space with bikers and kept to the side where necessary. It was a cool morning run and a nice scenary greeted us when we reached into the open for the pipeline trail. I liked a slow run up the hilly slope, taking in the lush surrounding forest as well as the big, iconic pipes. We reached Murnane Reservoir and turned left into Rifle Range Road. 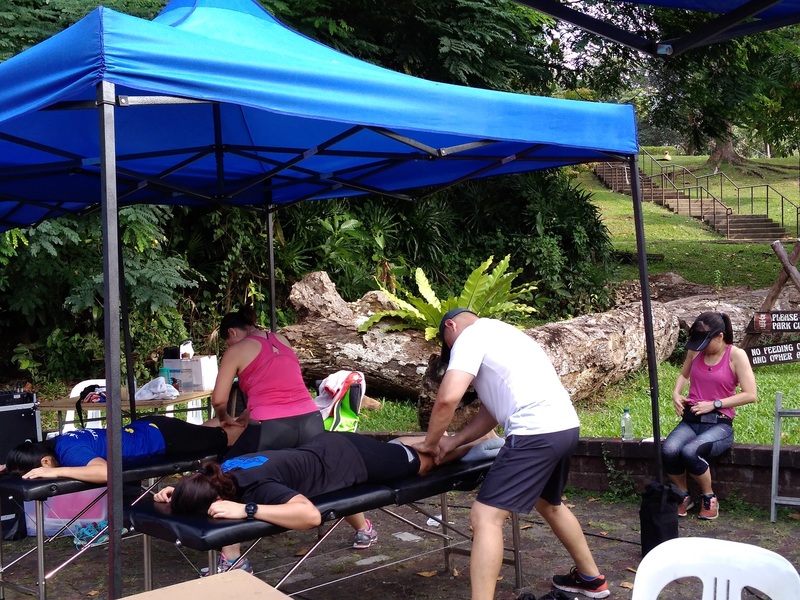 Rifle Range Road is popular with runners who love to traverse between Bukit Timah and Macritchie. It is also a place where cyclists (especially roadies) love to cycle up and down the gradual slopes to train their stamina. We ran past several SAF camps till we reached the end of the road, just outside Advanced Materials Engineering (AME). 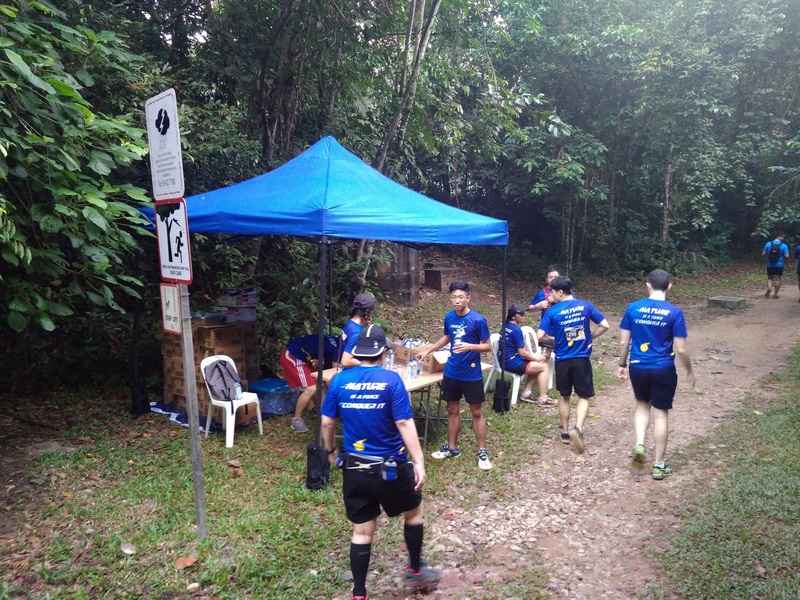 There was a hydration point here, just at the ‘entrance’ to Macritchie Reservoir. Volunteers distibuted some light snacks (chocolate biscuits) and helped the runners to replenish their water. 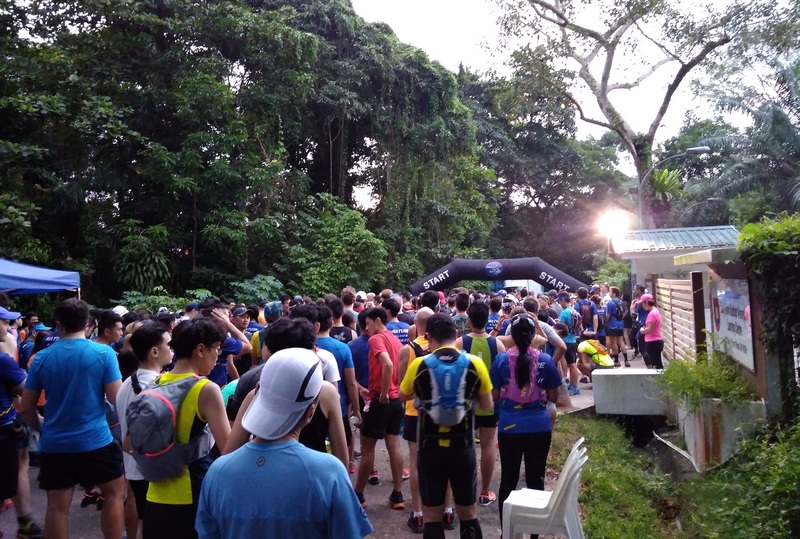 Macritchie was abuzz with runners and hikers in the saturday morning. There were students from different schools (e.g. ACS, Raffles) doing their training and we got to practise trail etiquette at times where the pathway became too narrow. It took me around 1 hr 57 mins to complete the race and crossed the Finish Point at the Park central. A volunteer hung the finisher medal over me, a nice gesture which made me feel the effort to race the trail was worth it! Runners were given some light refreshments, including bananas and apples. There was also complimentary massage, which I tried since there wasn’t many people in the queue. I lingered a while more at Macritchie before leaving at 10.20 am to take the Marymount MRT home. 1) The finisher medal is the same for all the 3 different race categories. I would prefer some differentiation, that the medal reflects the distance I ran. 2) It appears there weren’t any first aid providers along the race route. I think first aiders are more critical in a trail compared to a road race, as runners can be more prone to injuries due to the terrains. 3) The directional signs were sufficient, at least for the 12 km route. 4) It would be nice to have cold isotonic drinks at the Finish Point. 5) I thought the event tee should have The North Face logo. Wouldn’t it be great to own a piece of TNF shirt? 6) I would have preferred the race route to pass the Jelutong Tower towards the western loop of the reservoir. The scenery is nicer and we could have run on the boardwalk along the edge of the reservoir. I wouldn’t have mind if this may mean an extra 1 or 2 km, but that the overall race experience would be more memorable.